One of the really fun things I get to do is mess around with DIY cleaners. The inner chemist in me comes out and I play around with different formulas until I get something just right. My bloopers not withstanding, I can usually muddle my way through a recipe and make it work with minor adjustments here and there. Today I would like to show you how to make your own liquid castile soap for pennies. Well not really pennies but two full quarts of liquid castile soap for less than $1.50. Compare that to Dr. Bronner’s at $14 or $15 dollars per quart and you will see why I am excited. 1 What is Castile Soap? 8 Shop Emergency Essentials Sales for Fantastic Deals! The big kahuna in castile soaps is Dr. Bronner’s which makes a great product that simply grows on you. It comes in many wonderful fragrances (I like the Rose and the Peppermint) and the liquid version is concentrated so that a little goes a long way. The downside is that at $14 or $15 for 32 ounces, it is expensive. Dr. Bronner’s also makes a bar soap that sells for about $4 to $5 per bar. I will tell you why all of this is important in a moment. There is another brand of of castile soap that is widely available. Kirk’s Castile Soap has been around since 1839. As far as I am concerned, it is a hidden treasure in that it is priced at less than $1.50 per bar. Here are the ingredients: Coconut Soap, Water, Vegetable Glycerin, Coconut Oil, Natural Fragrance. There is also an unscented version. Being a relatively new fan of Dr. Bronner’s, and of course wanting a bottle in every single one of the luscious scents, I realized there had to be a better way. Enter Liquid Castile Soap “Wonderful”. This is so easy it is a wee bit embarrassing but stay with me. 1. Using your kitchen knife, slice and dice the bar of soap into small chunks. Or, if you are so inclined, grate it up with a vegetable grater instead. Castile soap in inherently soft so there is no reason to drag our the food processor or blender to do this. 2. 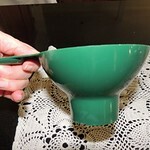 Measure out your boiling water and place it your bowl, pot or do as I did and use a large Pyrex measuring cup. 3. Add the chunks or flakes and walk away. Go do something else. Walk the dog. Catch up on Backdoor Survival. Just do something. When you come back in an hour or so, most if not all of the soap will be dissolved into a nice concentrated liquid. At this point, transfer your liquid castile soap to some mason jars, a squirt bottle or other container and you are ready to go. Within 24 hours, my batches of liquid soap turned gel-like and semi-solid. A quick run under hot water brought them back to liquid form. In a way, this makes sense because coconut oil does not liquefy until it reaches 76 degrees. Given the tremendous cost savings, this was something I could deal with. I tried both cutting the bar soap into chunks with a knife and grating it with my vegetable grater. I felt that the vegetable grater resulted in a better end product. I believe the soap dissolved more quickly and for some reason the resulting liquid was smoother. I don’t know – hard to describe. As will all castile soaps, there will not be an abundant amount of sudsing. The suds in most soaps comes from sodium lauryl sulfates, a known irritant that does nothing but make suds. Be aware that you may get a few bubbles with this, but not many. Odd as it seems, it still clean very well and does not feel at all oily even though it is an oil based soap. Those of you familiar with my Dirt Cheap Soft Soap will notice some similarities although there is no added glycerin in liquid Castile Soap Wonderful. Castile Soap Wonderful has a completely different texture plus it is highly concentrated. This is the fun part. With a simple dilution and the addition of essential oils, I was able to make up multi-purpose household cleaners just like I do with Dr. Bronner’s. The addition of 1/8 to 1/4 teaspoon of essential oils results in such a useful cleaner that I started calling them “You Name It” Wonderful. I now have Tea Tree Wonderful, Lavender Wonderful, Orange Wonderful and Peppermint Wonderful. This is so fun. For the past three weeks I have been keeping a list of how I use my various castile soap wonderfuls. Amazingly, I have I found that a single dilution, poured into a spray bottle, does it all. So far I have not found any reason to use the soap undiluted or in a stronger or weaker dilution. Window and Mirror Cleaner: For some reason, my castile soap wonderful cleans windows and glass just fine and without leaving a residue while Dr. Bonner’s tended to streak on me. Washing Hands: Instead of using soap in the pump bottle, spray your hands with a generous amount of Tea Tree Wonderful, rub your hands together and rinse. The tea tree serves as an effective anti-bacterial and sanitizer. Body wash: Spray your favorite scented wonderful on a washcloth and give yourself a “sponge” type bath. (Does anyone even use that term anymore?) Anyway, for extra moisture, you could add a bit of vitamin E oil or even olive oil to your spray bottle – just make sure you mark the bottle “body wash”. While you are at it, add a few extra drops of essential oil so you smell heavenly. Facial cleaner/facial wipes: Spray your Lavender Wonderful on to a microfiber cloth or plain old washcloth and use it to clean off every bit of makeup, even mascara. Your face will feel nice and soft afterward. Toothpaste: I kid you not. Spray some Peppermint (or other) Wonderful onto a toothbrush and brush away. I do prefer regular toothpaste but if there were non available, this would work just fine. Eyeglass Cleaner: Castile wonderful will make your eyeglasses sparkle. Because you are cleaning with soap, you do not have to worry about ruining your Transitions lenses (never use a vinegar solution on them). Clean fruits and veggies: Spay and wipe to remove gems and pesticides from non-organic produce. Doggie Shampoo: I used a combination of Peppermint and Lavender Wonderful for Tucker’s bath this weekend. After wetting him down, I got out the spray bottle and sprayed away. Are you detecting a common theme here? Clean Your Shoes: Spray and scrub. My 5 year old Clarks sandals came out looking nice and fresh and ready for another summer. Clean Makeup Brushes: For those of you that wear makeup, spray your brushes every few days then wipe them clean with a microfiber cloth. The bristles stay nice and soft and smell great. No more built up makeup goo. Dusting Spray: I have been using this spray for three weeks on my wood furniture and most notably my desk which get very grimy. I have also used it on my iPad and laptop screens and almost anything else you can think of. One thing I did not try (but want to) is making a homemade soft scrub by combining 1 tablespoon liquid Castile soap and 1/3 cup baking soda in to a scrubbing paste. Just thinking about it, it seems to me I could sprinkle some baking soda on my crusty pan or gunky sink and just spray and scrub without making the paste. Even though it only costs pennies, using an undiluted tablespoon seems wasteful. Again, I have not tested this. I am sure there are lots and lots of other uses – these are just the ones I have tried. In the past I have referred to “Rose Magic” and “Peppermint Magic”. The only difference between Peppermint (or other) Magic and Peppermint (or other) Wonderful is that “Magic” uses Dr. Bronner’s and “Wonderful” uses the DIY liquid soap make with Kirk’s. Same dilution, no difference. There are lots of websites that have similar instructions but as you will find, everyone has their own dilution and their own way of doing things. This is my way and it works for me so I have a high degree of confidence that it will work for you too. Shop around and you might find a deal on Kirk’s bar soap. I initially picked some up at Safeway when I was in the Seattle area but by far, the cheapest place I found online was at drugstore.com. I paid $3.79 for 3 bars and since I also purchased some other products, shipping was free. I am told that some Wal-marts carry Kirk’s at a similar price so it is worth checking locally. I have now stocked up on Kirk’s and will put some in deep storage. At this price, having the ability to make my own scented liquid castile soap any time I want to sounds like a good proposition. Not only that, I am convinced that being armed with vinegar, castile soap, spray bottles and microfiber cloths, I can clean anything! If you have not done so already, please be sure to like Backdoor Survival on Facebook to be updated every time there is an awesome new article, news byte, or link to a free survival, prepping or homesteading book on Amazon. You can also follow Backdoor Survival on Pinterest. Bargain Bin: Below you will find many of the items mentioned in today’s article. As always, check your prices and for heaven’s sake, don’t get tricked into buying a single bar of of Kirk’s castile soap for $5. Kirk’s Original Coco Castile Bar Soap : This is a great price at $3.79 for 3 bars from drugstore.com. Amazon also sells Kirk’s here – Kirk’s Castile Soap Original (3pk) . Amazon Basics Microfiber Cleaning Cloth, (Pack of 36) : I just noticed that Amazon is selling their own brank of Microfiber cloths – 36 for less than $20. They are not as “fuzzy” as the Z-wipes. I have both types. Whatever you choose, they will last for years and will allow you to replace paper towels forever. I color code using green for glass and windows and the other colors for everything else. NOW Foods Peppermint Oil : I favor peppermint essential oil (okay, I like Lavender essential oil too) so this is what I get. There are many types of essential oils to choose from. Take your pick. One thing you will find is that a little goes a long way. Soft ‘N Style Clear Spray Bottles I happen to like these smaller bottles and you can not beat the price for a set of 6. Likewise for these Pump Dispensers. 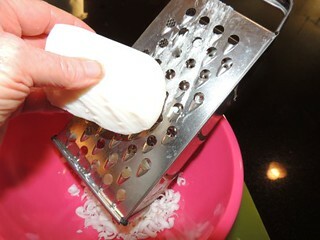 Box-style Hand Grater : As easy as it was to use a kitchen knife, it just felt “better” to grate the bar soap by hand using an old fashioned grater. Norpro Extra Wide Plastic Funnel : I don’t know how I ever got along without this $3 canning funnel. so once you have made this. how long will it keep and do I need to store in plastic or glass, cool place? THANKS! Since it is liquefied bar soap, I have no reason to believe it won’t last indefinitely. I store mine in mason jars but I don’t think it really matters. I use re-purposed apple juice jugs a lot. I clean them well with bleach first, though. I did thought that liquide castile soap will last indefinitely. I will do an experiment myself. This is not true. Any additional water added to soap allows for bacterial growth. As a soap maker, that is why we don’t just grind up our hand made bar soaps and add water. Your mixture should be used within a short time period, and favorably stored in the fridge. I’ve used Dr. Bronner’s Soap off and on over the last 30+ years 4 or 5 ways. Thanks for giving me this recipe and more ways to use castle soap. I will look for Kirks brand at Wal-mart. I can tell you that when you use it for washing dishes or clothes in a pan( did this while camping) if you put the soap and water in the pan first and swish your hand around in the pan you get suds and it distributes the soap well for the items you are washing. Happy soap making!! I have always found Kirk’s castile soap too drying for my skin. You are actually rebatching your soap and this works very well. Castile soap originally was made from olive oil and nothing else (except lye to make it into soap). Nowadays, coconut and other vegetables oils are used to increase the sudsing and make it less expensive. Have you tried making soap from scratch? It is easy and cheap and you can make it as mild as you need or just for general purpose. It is a skill that is great for survival and handmade soap is great for barter, too. Emily – I am so glad you stopped by. If you have any questions, be sure to ask. This is exactly how I made the shampoo for the beauty shop where I worked in 1941. Thanks for the new recipe. I like the idea of using something for more than just one purpose. Eight years ago when I first heard of laundry soap parties, I thought how great people are discovering what our grandparents did! Then I saw replies from manufacturers stating that creating laundry soap etc required using chemicals which could explode and otherwise injure women trying to do make their own. I have never been so happy to find more and more people who don’t believe what they are being told be marketers and manufacturers. 🙂 My next question…how do we make our own vegetable glycerin? I made this castile soap. It is my first encounter with the stuff apart from seeing bottles of it at the store (only noticing them for the first time AFTER getting into my first homemade cleaner, laundry detergent, and seeing that every other cleaner called for this soap and tee tree oil). I wondered why mine may have turned out watery. Andria – Has it been 24 hours? It does thicken up after a day or so and becomes much thicker than Dr. Bronner’s. Mine is still watery after 24 hours and I’m wondering why? I have been experimenting lately with my soft soap but I believe the same principal applies. Something that has helped is that after the soap melts, set it aside in the pot and do not touch it, stir it, or otherwise disturb it for 24 hours. I have also had success bringing it (my soft soap) to a full boil for about 5 minutes to thicken things up. The I proceed to set it aside for 24 hours. Just like Dr. Bronner’s, you will want to dilute your homemade liquid castile soap. I have been experimenting with a technique that does not touch the soap for 24 hours after making it. Then, after that, I whip it up to a desirable consistency. This has worked really well with my first trial but I need to repeat them to make sure my trial was not a fluke. Another thing is that I am experimenting adding a bit of kosher salt as an emulsifier. This was worked with my EO and carrier oil combos; I am amazed. I hope these suggestions are helpful. With enough dilution, you should not have a problem using repurposed pump bottles. Stick it in the refrigerator. It will solidify! Yes it’s been weeks, and I let it sit in the container for 24 hrs. Are you referring to the DIY Liquid Castile Soap or the Dirt Cheap Soft Soap? 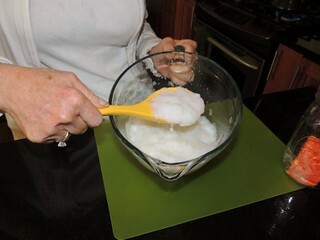 If it is the Soft Soap, I would add about 2 tbl of additional soap flakes and “cook” it a bit more (3 minutes). The Soft Soap is a bit runny and “snot” like and seems to vary quite a bit from one batch to another. That is probably due to the type of soap used. No it’s the kirks liquid castile soap recipe. Andria – I am not sure what went wrong but if it were me, I would add more soap flakes and heat it up so the soap melts then see if it thickens. You are the first person to report this and like I said, my liquid castile soap is like a blog it is so thick. I made it for the first time and mine is also liquid…like skim milk. I used the 8 cups of boiling water t 1 bar grated of Kirks Castile soap. Sometimes just waiting a day will firm it up. On the other hand, I would prefer mine to be more liquid. I do believe the variance has to do with the water and the minerals in it (or lack thereof). Hi. I am having this same issue and its sat for a week now, not thickening. I started by boiling water for 10 minutes, then measuring it my 8 cups, then added the grated soap. Mixed it up a bit until the flakes dissolved and set it aside. (after giving it a cover). What I have even after a week is just as runny as tap water. Something went terribly wrong, and I fallowed the directions just as written. Any help would be greatly appreciated. Mine is thin also, like milk. It hasn’t been 24 hours yet, but I hadn’t read through these comments so I did stir it several times. If it’s still thin, I’ll try the boiling method. If that doesn’t work, I’ll add some of the other bar. I’d rather it be on the thinner side, but not this thin. I did find the bar soap at Walmart. Thank you much! I may also just start over from scratch. So cheap, why not! Mine was thin at first, but I did it before going to bed and put a tea towel over it, went to bed, and the next morning it was nice and thick! Thanks for the recipe!! Liz – Yes, I have been using it in all of my DIY products. I used it to give Tucker the Dog a bath and got the same results as Dr. Bronner’s Peppermint Castile Soap. I do not like to use castile soap on my own hair (too drying) so I have not tried that. Mine has sat in a cool basement for a few weeks, but hasn’t turned to gel or changed in any way. Is it really as concentrated as it says? I used 8 cups hot water and 1 bar of Kirk’s castile soap that comes in a pack of 3. Is this a smaller bar than you used? I’m sure I can use my mix as is, but wonder if I can really dilute it like you do in your recipe. Thanks for any input! Even if it isn’t super concentrated, it’s still a lot cheaper than Dr. Bronner’s, and I like the ease of storing more bars for future use. Thanks. Yoda – Yes, I believe that is the same sized bar of soap that I used since mine was also from a 3-pack. I have had only one other report like this and just thinking out loud, I am wondering if it is the water? I happened to use water that was filtered (out of my Berkey). The other thing – and you have nothing to lose – is to try boiling your soap mixture for about 5 minutes. I did this by accident with my Dirt Cheap Soft Soap and it thickened up and was not so “snot” like. It is worth a try. Other than that, the cost is so little, it would be worth trying again. As far as the dilution, I don’t see why not. It seems to me that the same dilution would apply. The thinner soap might even be advantageous in that you would not have to shake things up (literally) quite so often. As long as I know it’s the same concentration as yours I will go ahead and use as is. Like you say, may be advantageous to NOT have the heavier gel. Can’t wait!! The water I used, BTW, is the super clean stuff you buy in gallon refills at the grocery store. Maybe it’s too pure!! Thanks so much for your post and for getting back to me on this. Well, I used tap water and have the same issue of it remaining too thin. Any chance that you have a water softener? Just grabbing straws since I can’t duplicate the problem. This happened to mine, too. I do have a water softener and a reverse osmosis system. I thought it was acceptable to use this in place of distilled water. Thoughts? I am getting ready to add another bar and cook it again. How long has it sat unattended? I will be making this as soon as my order of Kirks Castile comes in. Thank you so much. In case anyone wants to know where to get the bar soap at for the least – I went through Dr Vita because ti was free shipping and no tax and only $1.25 per bar. Free shipping is a good thing! I dilute mine in a 1 quart jar. This is more concentrated than your recommendation. I think the reason it calls for the stronger concentration is that it is used for making homemade laundry “soap” (not detergent). Do you think this could be the reason? I will have to make both recipes… One for my laundry soap and the other one for the Wonderfuls. Okay so I am adding the extra bar now to the 8 oz of whater. The bar of Kirks is 4 oz and comes in a pack of 3. Then for good measure I am boiling it for 5 minutes. All of the water I use is filtered or spring water. And when I grate mine I use the fine grate that is the small version of the grater side shown in your picture on the blog. Maybe we can figure this thing out together at what seems to work and what doesn’t. I’ll be reporting back what I find. Thanks for all the help! 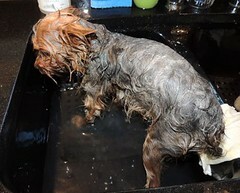 Anyway, about bathing the hairy kid (the dog), have you tried using the soap with tea tree oil? Tea tree oil is supposed to help keep the fleas and other critters off of the dogs. In fact you can buy dog shampoo with tea tree oil already in it at Amazon. Looks like what you made with tea tree oil should work just fine! Jim – George and I have been friends since 1971. Yes, we are that old LOL. Anyway, so far I have only used peppermint and lavender when shampooing Tucker the Dog. But for sure – I would use tea tree oil the critters were hovering. Did you see my article on tea tree oil at //www.backdoorsurvival.com/miracle-of-tea-tree-oil/? I’ve read that tea tree oil can be toxic to dogs so I would definitely do some research on how much you can safely use. Could you tell me if this would be ok to use in a dishwasher? I understand “they” changed the mixture of the detergents, and all of a sudden, my glass items are cloudy. Vinegar helps somewhat, but we do not always remember to put it in the rinse cycle. There are many DIY dishwasher detergent recipes out there. I need to try a few and see how they work. From what I have read, however, depending on where you live and the water, the results are marginal. Be sure to let me know if you try this. Hello, I did some reading up a couple of years ago on trisodium phosphate. Apparently that is the cleaning, “sparkle” ingredient that became demonized and then removed from detergents for clothing and dishwashers. According to the info I read, we have once again been hoodwinked by the-powers-that-be. You can buy trisodium phosphate or, TSP from the paint section in Lowes or Home Depot and add a teaspoon or so with your detergent. If you can get your head around all the dire warnings, you will find your answer. I found your website several months ago from Pinterest and remembered you had a DIY liquid castile soap recipe I wanted to try for a shampoo base. I had used Brommer’s in the past, but no job, then low-paying job = no expensive body care products. Unfortunately, my little brain forgot about the wonders as soon as I closed the computer. Fast forward several months and one monstrous case of bronchitis. As I was waiting an hour and a half for a 30 minute prescription at Wal-Mart, I ran across it…yes…Kirk’s castile soap. 3 bars…$3.79. For the life of me, I could not remember if it was a good deal or not. But I was there, it was there, obviously meant to be. So, here I go to grating. Thank you for your insight and chemistry lessons! Wow – no gel. I would say that is a good thing. I think it has something to do with the minerals in the water. Whatever the reason, I wish mine were not so thick and goopy although it does dilute well. BTW, we add Melaleuca (tea tree) essential oil to the diluted soap. If you make this exactly by the recipe and it does not gel over nite, stick in in your refrigerator. It will gel in the fridge and when you take it out, it is perfect. No need to refrigerate after that. I learned this by mistake and it works perfect! I poured mine into old bleach and vinegar bottles after I boiled it, and now the mixture is too thick to get out. What do I do? I didn’t know it would thicken up like it did. I used it while it was still liquidy (along with some vinegar in the rinse cycle) in my dishwasher, and they came out clean! It was a great feeling knowing I’ve got cleanser for just about everything for about $1! Thanks for your help. Try adding a bit of boiling water and see if you can break it up. I ended up storing mine in mason jars so I could scoop it out easily. How much did you use in the dishwasher? I still have not tried that. I have been anxiously waiting to use your “wonderful” recipe since I saw it last year. (I had a huge store bought bottle which I needed to use up first.) Well, I finally got to try your’s yesterday. WooHoo! I just reread your post for about the 6th time and it suddenly dawned on me. It is summer in the SE USA. We keep our AC at 78 degrees. My giant jar of coconut oil is currently liquid. If it is the coconut oil which makes it gel well that might answer that question. Even if it stays liquid, I’m ok with that. It will be easier to use. Thanks for letting you inner chemist shine. I am always too afraid of mistakes to experiment too much. One thing I have not tried is using my DIY Liquid Castile Soap in the washing machine. Today is the day – really. One note: I suspect that the mineral content in local water may play a role in whether it gels or stays liquid. I made gallons of the stuff and it lasts forever but next time I want to use distilled water just to see what will happen. First: LOVE this!! Been wanting to try all these recipes using liquid castile soap but just can’t afford it :/. 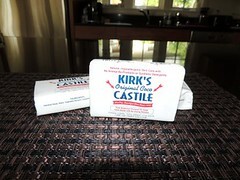 I use Kirk’s Castile Bars for laundry and dish soap though! You mentioned that it got gelled and running it under hot water re-liquified it. Do you have to do that prior to each time you use it? I very rarely use it full strength so I only have to un-jell when I have making up a dilution (i.e. for all-purpose cleaner). I have had reports that others do not have the problem with jelling so I suspect it might have something to do with both the water (I used filtered water) and climate. I am not sure I understand the question since I just use them. When dirty, I toss them in the washer. We go through about 3 rolls of paper towels a YEAR. That’s it. I use the microfiber cloths (aka magic rags) for everything!! thanks for answering. What I was wondering about was grease. If I use a cloth to wipe up grease, then put in washing machine, will the pipes get stuck with grease permanently? Gosh, I am so micromanaging. My Wilton cake teacher told us to wipe out greasy bowl with whatever, but throw away, don’t rinse in sink. thank you. I really like all your columns. No problem at all, Diana. The microfiber cloths handle greasy messes just fine and they can be used again and again after being laundered. Remember, though, no bleach. Would you mind explaining why you chose not to add a little glycerin? I have been looking at several recipes and noticed one said the added glycerin helped the soap pour into the container. Not sure if that was the only reason though. Apparently without it, this soap maker had to push the soap in to the container. Thanks so much. Glycerin is a moisturizing agent. Since the resulting “liquid” castile soap is used in a myriad of ways, including household cleaning sprays, the glycerin would be superfluous and even undesirable. You will always see glycerin used when creating “soft soap” used for hand washing. This is due to it’s aforementioned moisturizing properties. Kirk’s Castile bar soap contains glycerin so there is no need to add it. Hi, sorry I’m feeling a bit slow today! Let me just get this straight … so first off you mix 1 bar (is it 4oz?) in with 8 cups of water. Then when making hand wash/shower gel etc. you further dilute it again? So the first part of the dilution (diluting it was 8 cups) it will end up still being quite solid, then you re-melt it to further dilute it again? Does that make sense? Sorry, just getting a bit confused! Kate – If you have used Dr. Bronner’s Liquid Castile Soap, you know that it is highly concentrated and must often be diluted before being used. A little goes a long way. The DIY version is much the same although in my case, I found it was more gel-like than liquid. The dilutions I use, however, are similar to Dr. Bronner’s. Note that as with Dr. Bronner’s, there is some trial and error involved due the hardness of the local water supply and also in accordance with personal preference. I hope this helps and makes sense but if not, holler. So I can substitute your soap in my homemade skin care products at the same quantity that I’m currently using dr brothers liquid soap?? That is what I do although sometimes I need to use less because my DIY product is more gel-like. The consistency of DIY castile sopa seems to be dependent upon the water you are using (and the mineral content therein). So when you decide to use less, it’s only for the sake of consistency, correct? My concern is only regarding potency. I prefer to use bar soap for showering. Is it possible to liquid the Kirks, add some essential oils, and get it to solidify again to make bars? Interesting you should ask because I am testing out a recipe to do just that this week. The basic process is to grate the Kirks then melt it with a bit of water plus the oils. I am doing a bit of trial and error and should have some results in a week or two. Here’s my experience AND solution! The first batch did not set up as made by the recipe. I reheated it, added another bar of soap and put it in the refrigerator immediately after pouring into the jugs. It set up, SOLID. I let it warm to room temperature, added 8 more cups of hot water (so now I basically have a double batch of the original recipe), poured it into two jugs and put both jugs uncovered into the refrigerator. 24 hours later, perfect liquid Castile soap! They are now covered sitting at room temperature (74 degrees) and working great! I’m thinking they need to cool rather quickly so they don’t separate initially. Worked perfect for me after I thought to put it in the refrigerator! My last batch is still very thick. I might take advantage of your tip and see if I can return it back into a fluid liquid. As it is, I dilute it with each use so being thick is not a huge problem. Still, it would be nice to have it pourable. Thanks for your tip, Martha. I desperately need to clean the inside of my oven but dread using store bought oven cleaner. After reading this, I am hoping to find a natural solution. Has anyone used this wonderful concoction to clean the oven? Please share! I’d like to clean it this weekend if possible; however I need to purchase the ingredients. Thanks in advance! I have a self-cleaning oven and your comment reminded me that I needed to run it last night. I did find this article and it looks reasonable to me. Be sure to check back and let us know how it goes. Thanks Gayle. I went out on a limb yesterday and found a natural cleaner using vinegar, baking soda, lemon essential oil, and oregano essential oil. It worked pretty good. I added more baking soda for those problem areas to create more of a paste and let it sit longer before wiping it down. Today I’m using the self-cleaning to hopefully remove the remaining tough stains. If that doesn’t work I’ll try the link you provided! Thank you – now I need to find a solution for those pesky stove ring – thingies! I’ve made soap from scratch (for a science class I taught) using animal fat (hard soap)/vegetable oil (softer soap) and sodium hydroxide/wood ashes, using the ratio: 2 parts water:1 part lye, 0.38 parts lye water:1 part fat (by weight; ie. 6oz lye water to 16oz fat). Before you get started, you MUST wear gloves and goggles to protect yourself. You basically dilute your sodium hydroxide in a glass container by slowly adding the sodium hydroxide to the water while stirring (when diluting strong acids and bases, add the water to the container first then very slowly add the acid/base – this minimizes the chemical reaction because the excess water absorbs the heat that is generated, doing it the other way could lead to a violent reaction/explosion). Heat the fat while stirring (especially solid animal fat) at low heat to begin to dissolve and slowly add the alkali sodium hydroxide water solution. It is important to use the ratio above, if you add too much sodium hydroxide, there will be excess in your soap – which will irritate and damage your skin (the only way to remove acids/bases from your skin is to rinse your skin with a copious amount of water to remove most of the acid/base and then neutralize them with a mild counterpart base/acid; sodium bicarbonate (baking soda) works well for acid neutralization and vinegar/lemon juice works well for base neutralization. The mixture will eventually form a paste, at which point you can remove from the heat and store in fragrances and other oils, if you desire. Lastly, fill molds with your hardening soap to make bars. Have fun! On a completely separate topic, have you thought about making a backup copy of your website or compiling all of this useful information into a PDF or similar file, should we lose power for good/an extended time period? It would be great to be able to go back to this information via a laptop or other battery powered device. Thanks for all the useful information. You are not the first to suggest a backup copy or even a DVD with all of the pertinent articles from Backdoor Survival. I have looked into authoring tools and as far as I can tell (and I am not an expert at such things), each article would have to be added to the archive individually. That would be a huge, time-consuming effort. As it stands, I try to spend an hour or two each week cleaning up old articles that need to be updated and reposted because they are lost in the archives. This is very slow process and I have been unable to meet my goal of 2 per month. I also need to go back and set up more relevant categories and then set up category archive pages. If anyone knows of tools that would allow me to easily put articles into a PDF or DVD, I would love to hear from you. PS – I would also like to put some of the DIY articles on YouTube but lack the time to figure it out. Could you not just copy and paste the articles into Pages, and then select Export to PDF? Then you just save them in a folder on your computer. I made this yesterday, using one 4 oz bar, and reverse osmosis water. 2 quarts of water. Boiled for 5 minutes and let sit undisturbed for 24 hours. It’s very clear and thin. I was curious why you said at the beginning that you get a quart of liquid castile soap for under $1.49, but your recipe calls for one bar of soap and two quarts of water. It doesn’t lather much, but if the dilution is more…..open for suggestions…. Lucinda – I tried to find my original notes but they are long gone. You are the first one to catch this. I will make another batch and try to figure this out. My guess is that 1 quart of water was not enough so I added another. Regarding the fact it is thin: How warm is your home? I keep my home very cool (65 degrees) which accounts to the gel-like texture. Also, the minerals in the water (or lack thereof) will result in differences in the final product. You can try adding another half bar of castile soap to thicken things up but I would attempt to use it as is first. Don’t do a thing!! Just change your quart comment to TWO quarts. Let me tell you why….I poured my soapy “water” into a half gallon jar after 24 hours, shook it a little bit, and wrote my post above. Got up the next morning, and noticed my previously crystal clear half gallon jar was turning cloudy….gave it a little shake, and noticed it was thickening up a little bit. Fast forward another 24 hours, and I have a half gallon jar of opaque soap gel. Used my cookie scoop to plop a scoop into an empty foaming hand soap bottle, added a drop or two of citrus blend essential oils, shook them together, added water, leaving enough room to shake/blend together, and now have a very nice bottle of foaming hand soap. Time was all I needed to see it come together, and I am so very pleased! Thank you!!! Yay! Thanks for the update. I need to get a foaming hand soap dispenser one of these days. This is exactly what I have been looking for! lol Everything I find wants to use this soap for washing hair or body but I was wondering about cleaning everything else. I love my Dr. Bronner’s and the company has such a good message I want to support them but I also love saving money. I think I will go forward as planned making Dr. Bronner’s bars into liquid castile soap. Thank you! <3 Since I am wanting mine farely liquid I am thinking 1 bar for 1 gallon of water and then I can put it right back into the bottle. Hi I want to make body washing gel for bathing yet there is no castille soap in my neighborhood in Kenya… Please help. What is a substitute for this soap?. I have a bar of goat milk soap (olive oil, coconut oil, Palm oil, mango butter, fresh raw goat milk, sodium hydroxide, fragrant oils). It smells like lilacs. Since it is primarily made of oils like a castile soap, but lacks the glycerin of Kirks, I wondered if it would work to make liquid Castile. Has anyone tried this recipe with Castile soap other than Kirks and had success? Or should I stick with the dirt cheap liquid soft soap? Please let me know! I heard that Tea Tree oil should not be stored in plastic, that it will eat it, including the lid. Is that true? Maybe in such a diluted amount, it’s not a big deal? Pure essential oils that are not diluted should be stored in glass but if used in a potion, salve, or cleaning product, they will be fine. I have never had a problem and do it all of the time. I use Kirk’s Original Coco Castille soap as a body bar & just ordered more today from Walmart online. It’s $3.28 for a 3 pack of 3 oz. bars. Tough choice – Dr. Bronner’s at $14-$16 / qt. or approx $1.09 per 1/2 gal.! I do keep an ongoing Walmart list & wait until I can spend more than $50.00 to get free shipping. In fairness to Dr. Bronner’s, it is VERY concentrated & lasts a long time but I like to DIY where I can. Thanks again – perfect timing for me! Hi, how much does your soap bar weighs? Will look for something similar in Australia! I checked and each bar is 4 ounces. Hope this helps and that you find something comparable. If the bar you find in a difference size, you can always adjust the amount of water. I will also respond online. One suggestion is that you can use a bar of Dr. Bronners Soap. I have not tried it but that should closely mimic the liquid. Oh my goodness….I love this stuff!! I made this today and used lemongrass essential oil. I am using it as laundry aid for my hubby’s stinky biking jerseys. I just spray the underarm/neck areas really well, throw it in the laundry and BAM! Smell is gone!! I made this this morning. Bought distilled water for this but used tap water we have a water softner. It is milky but the consistency of water. Hoping it will thicken up by tomorrow. Havnt recieved the essential oils in the mail yet but dilluted this cleaned the living room windows the tv screen my glasses the range hood ect. Seems to work well. Ill be glad when i get my sweet orange oil for a degreaser. How would yuo use this as shampoo? Our grandson has gotten head lice at school and I’m going to make teatree and peppermint just use about a tea spoons worth? Hi Gayle, I’m excited about using my new batch of liquid soap. I’m a little disappointed though because after I made it I read the ingredients on my newly purchased Kirks Castile bars: Sodium Cocoate (variant of coconut oil), water, glycerin, sodium Chloride (salt), sodium gluconate (another salt) and fragrance. It may be the same ingredients, but couching it in chemical terms made me think I wasted my time trying to go natural. Kirk’s Original Coco Castile Soap is a heritage product dating back to the 1800’s. We recognize that over the years our consumers have more desire to understand what is in their products. In 2015, Kirks Natural made the decision to offer full disclosure for ingredients in our Kirk’s Coco Castile Soaps. In an effort to be transparent, we want to bring this to your attention. The new wrappers that you will begin to see on your store shelves will have a simple and straightforward label. So all these years they have been fooling us? I thought it contained pure coconut oil and not a chemical cocktail. I am going to use Bronner’s bar soap in my next batch. I will still save money; just not as much. As far as the ingredients, what concerns me most is the glycerine. It appears as though the glycerine originally specified it as vegetable derived. Now it does not specify to it being vegetable so it could be petroleum related. I’ve been trying to stay away from petroleum products. Yuck. SOOOOO, are you saying NOT to use the Kirk’s now? Wanting to make next weekend so I am gathering my ingredients now. I am on the fence relative to Kirk’s. When I called them, they told me the change to the label is simply “clarification” of the existing ingredients. WTF? I know it costs more but I am now using Bronner’s bar soap instead. On my to-do list is to try the coconut based soap from Tropical Traditions. I researched the ingredients and they are true to what they are. All natural. Sodium Cocoate (generic name for the mixture of fatty acid salts (acid salts) of coconut oil that is used in soap making,Water, Glycerin, Sodium Chloride (common salt. ), Sodium Gluconate (fermented glucose), Fragrance. So I will definitely be using this. what does tbl stand for in recipe? Tablespoon. Sorry that was not made clear. Just a quick note to say THANK YOU and YOU REALLY ROCK!! You might have already answered this question and if you did, please forgive me for asking it again! 🙂 But, I was wondering if I can use the homemade liquid castile soap in foaming soap recipes. Thanks for all of your wonderful information! I made your recipe above and it turned out wonderfully! I just found a recipe I want to try and make for dusting spray and it says to use 1/2 a tsp of dr. bronners liquid. How would that translate to your recipe? It is a 1:1 substitution. BTW, I have a fantastic dusting spray I use. I really need to put it out there. As I recall, though, it does not use soap. It uses a bit of Olive oil and vinegar plus water. My soap turned out very watery:( I used distilled water and it been 24hrs. I am doing another batch with 4 cups of water instead. Are you sure your ratio is right? The ratios are correct. What I have learned is that the water makes a huge difference. My DIY Liquid Castile Soap is thick and gel-like whereas others are watery. Where do you like and what is your source of water? That said, you can try to re-batch by adding more soap flakes. It finally thickened up! It just needed more time. Thanks for this recipe! I’m so pumped up to start using it???? OK I’m new to making things at home.. I’ve messed up some and something’s turned . my question is I tripled the batch … Fist mistake… Then I just used fauset water….second mistake I live in Philly PA. Hard water…. Now I have all these bottles and there are long snotty flotters in my bottles… Now the question lol…is it ruined? Can I fix it? Is it considerate? Or can I just use it as is? I have all this soup I think lol I don’t know what to do with it .thank you Kate.m. I don’t have any definitive answers but will share what I would do. I would take 1/4th or 1/3rd of what you have made and re-cook it. Bring it to a simmer for 20 or 30 minutes. After that, turn it off and let it sit undisturbed for 24 to 48 hours. (Other readers have had luck putting the pot in the fridge but I have not tried it). Also, note that some of us (myself, for example) end up with a very thick, gel-like product. It still works and dilutes just fine using the same ratios as Dr. Bronners. Others end up with a more watery product. My guess is these differences are due to the mineral content of the water. Regardless, the end product cleans just fine. Plus, it is dirt cheap. Made this yesterday to begin the wonderful in my home. Still watery. I put it in the fridge and am waiting for thickening. I already made another quart jar of dog shampoo. I used 3 tables. Of soap, 1/4 cup coconut milk, 4 drops lavender, 1 drop tea tree, and filled the rest with water. Using the dollar sign and the word dollars together makes you look like an idiot. One or the other, but not both together in conjunction. IS there an natural soap that does not use coconut in it? I am allergic. Thanks so much for this recipe! I doubled it because I needed a large amount of Castile soap for homemade Christmas presents. I let it sit for 24 hours before stirring it again and after 48 hours, it looked just like hand soap I’d usually buy. This recipe saved me a lot of money for Christmas. It’s perfect! I’m planning on using this in lots of recipes that call for liquid castile, including yours. In the other recipes, would I still dilute FIRST or use it straight? In other words, is it the form that you get after 24 hours that I would add to my recipes or the diluted version? The DIY version is used exactly the same way as Dr. Bronners which means you dilute it in accordance with your recipe. Be aware that depending on what I believe to be the mineral content in your water, it may be very thick or very thin. I need to do some new tests to pinpoint why this happens, however. I am just guessing that it is the water. Regardless, you will typically dilute it first. You did not indicate whether you have this problem with both Bronners and the DIY version. But in either case, it sounds like you are not diluting the concentrated soap enough. For general cleaning, I use 1/2 cup to 2 quarts of water. I mix it all up in advance then use this mixture to fill my spray bottles. I use this on everything: granite counters, sinks, and my stainless appliances. I even use it to clean up spots on my carpets. Does this help? PS – This is too strong a dilution for glass. Just wanted to say thank you! Almost 5 years after you took the time to share this knowledge and for the additional time you took to respond to the stream of questions and replies – this article is still relevant and useful. Again, thank you! I made the liquid dish soap and found that it was leaving a greasy residue. Does no one else have this problem? Any way to fix that?